This quick to use connector saves time and effort compared to other connectors available on the market. It also removes the need to solder on site. Easy to use connector. Just unclip the bottom part of the connector and carefully push our CA3F20 3 core cable then close. The cable can be easily removed and replaced when needed. On the top side push the LED tape inside the existing 10mm slot. Always take note to ensure correct polarity before powering the strip. Compatible with all single colour Osram or Comus LED strips IP20 not wider than 8mm. Also compatible with strips having up 120 LED chips per meter. This power feeder can carry a max. current of 5A (so 120W at 24V or 60W at 12V). 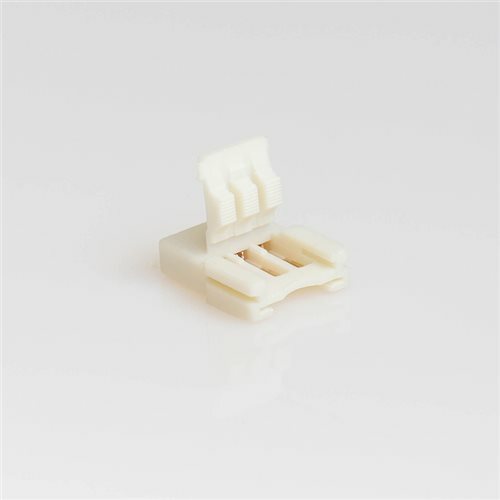 Fixing - we strongly recommend the use of a double adhesive tape underneath the connector or the use of silicone. This will fix the connector in place along with the LED tape connected to it.